See these two?? Well I love them. How do you feel about the HST? Yeah I thought so…me too! I don’t know about you but I know that I don’t want… my YOGA, massage therapy, airline tickets, naturopathy, concert tickets, non prescription meds, movies, bus fares, spa services, vitamins, dietary supplements, chinese medicine, movies, taxi’s, home maintenance, parking, school supplies, membership fees (including the gym), hockey tickets, hair cuts, golf fees increasing in price by another 7% in tax if I can help it. If you enjoy any of those things (which we all do) then add up what you would spend on those items/services per year and multiply it by 7% to see how much more you (and I) will be spending with the HST. 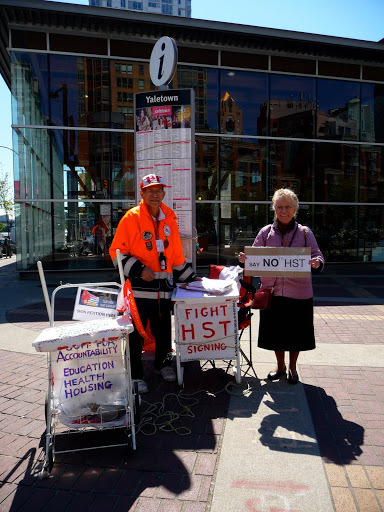 Anyways..I ran into these TRULY adorable folks directly in front of The Roundhouse this morning and if you live in Yaletown and would like to sign the Stop the HST petition these two are who you want to see! I had a few laughs, received some words of wisdom and learned a heck of a lot! He’s a ballroom dancer and has not had a sniffle in over 6 years! (he even showed me his ancient head rubbing/ ear pulling technique!) And he’ll show you too! haha! And did I mention he is 80? And the lady is lovely. Just so incredibly lovely, sweet, vivacious, and as smart as a whip! They really made my day ♥ And they can make yours too! These two will be in front of my favourite place in the world.. The Roundhouse each day from 900am-11:30am. The Roundhouse is located at the corner of Davie St @Pacific Blvd. 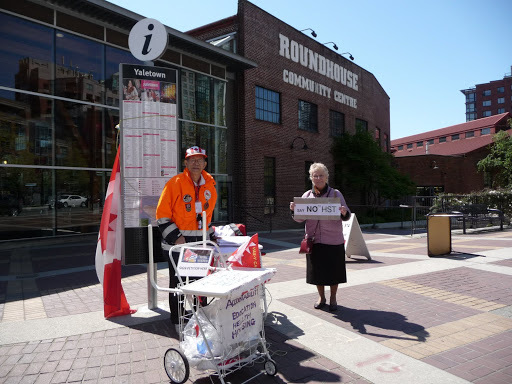 May 8, 2010 in HST petition, roundhouse, Yaletown.